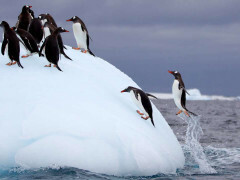 Explore Antarctica; The Final Frontier! Antarctica. The final frontier - the undiscovered country; its harsh wilderness environment is the stuff of legend, but would it surprise you to find out that some of the land is surprisingly green and lush? Get ready for a sensory overload; you’ll be inundated by the sheer beauty and dramatic landscapes of the white continent on an adventure where few human beans have stepped before. With tours departing from Chile or Argentina and ranging from 8 to 20 days, you’ll fly or hop aboard the Ocean Endeavour Cruise Ship to sail south into the Antarctic Circle, passed aquamarine icebergs, massive Blue Whales breaching, Killer Whales hunting seals or pods of Humpbacks playing in the icy blue, krill-rich waters of Drake Passage and Weddell Sea. What To See And Do When We Make Land? 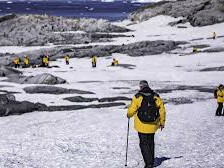 On Antarctica itself, while you follow in the footsteps of Shackleton, Amundsen and Scott, the crunch of ice under your boots will become as familiar as the intoxicating Midnight Sunset. You’ll take zodiac trips to unexplored bays, see millions of penguins, and even strip down to your swimwear to take a dip in the bracing waters of Neko Harbour. It might be the shortest swim you ever take, but the bragging rights will last a lifetime, which is longer than the receding glaciers.